The following essay was written for the same Religion In Film class that enabled me to talk about the spiritual themes of obscure vampire indies or disgusting Lars Von Trier art flicks and get credit for it. As with most of my papers for that class, half of it was written overnight while the other half was rushed out just before the “end” of the “day”, but due to laziness I have refrained from making any major changes to it, even though I hated having to use 1st-person (it was a personal assignment). While I wrote my Byzantium critique assuming the intended reader had no prior knowledge of the material, I approached this film knowing well that my professor already held it in high regard, and so decided to disregard boring plot synopsis and just spoil everything in the process of defending my thesis. If you have not yet seen A Serious Man and tend to like the rest of the Coen Brothers’ filmography, I would advise you to go hunt it down, form your own opinion, and then return here for enrichment, because it’s definitely one of those movies you should see if you like movies. Spoiler. Over my many years of critically watching and writing about movies to extract whatever message the filmmakers were trying to convey, I can’t recall feeling spiritually or theologically swayed by any film. The films that have impacted me on an emotional level number many, as do those that have influenced my feelings on politics, the psychology of man, his basic goodness or badness, and his general relationship to the divine. However, due in part to my own wariness of film’s inherent artifices, to my pretty firm beliefs, and to my general distrust of Hollywood, I would tend to shun or at least question films that bore overtly religious themes or claimed to hold the answers to all our questions. With that in mind, it came as a frustrating but respectable surprise that the Coen Brothers’ A Serious Man poses far more questions than it attempts to answer. While not outright denying the existence or the justice of God or really making any judgment on the faith of its Jewish subjects, the movie subtly remarks that many of our most earnest questions regarding God will always be incomprehensible, and yet this doesn't exclude the reality of an order and a reason behind everything that happens. The most a serious man can do is live with the limitations of his knowledge and gracefully accept whatever comes his way, for good or (in the case of its main character) devastating ill. As such, A Serious Man is both exceptionally pious and aggravatingly agnostic, at once extolling the wisdom of God’s plan for all of us and bemoaning our inability to appreciate or notice that plan in the present. The Jewish fable preceding the main events of the film does little to clarify the complicated messaging, though a quote from the Rabbi Rashi does provide a sort of framing ideal for the tests that the protagonist (and audience at some point) will undergo. “Receive with simplicity everything that happens to you,” counsels the prologue, and while the quote has seemingly no correlation with the opening chapter, it will come to shed a light on the central narrative’s conflict. Nothing in life seems to be going in the favor of Larry Gopnick, a physics professor and devout Jewish father who's defeatedly witnessing his family life crumble around him. His son and daughter endlessly assail him about fixing the TV or other meager problems, his wife Judith demands a ritual divorce and remarriage for no valid reason, his brother Arthur leeches off his generosity whilst working on a nonsensical book, and others at his school make his workplace living hell. All these calamities he abides not because he’s patient or long-suffering but because he lacks the willpower to make a declarative stand for his or anybody else’s rights. “But I haven't done anything!” is his refrain when pleading with his wife, his co-worker, and a record salesman on the phone. This raises the perennial problem of pain: how a just and benevolent God can cause so many misfortunes to befall a man who seemingly does nothing wrong, who, in fact, has an established habit of doing nothing at all. Throughout the dissolution of his marriage, Larry and his family consult with three different rabbis, each older and less insightful than the last. The junior rabbi advises him to find a “fresh perspective” on Hashem and see his ailments as “expressions of God’s will”. Once Larry tries this and finds he’s still not satisfied living in an endless downward spiral, he goes to Rabbi Nachtner for guidance and leaves more frustrated than before. “Why does He make us feel the questions if He's not going to give us any answers?” he wonders, but all the teacher offers is, “Hashem doesn’t owe us the answer. Hashem doesn’t owe us anything.” Just as Larry believes that he’s entitled to a reasoned explanation for his suffering, his slacker brother has fallen victim to a similar delusion, believing that he deserves a baseline level of blessings and cursing wildly about how little Hashem has given him in comparison to Larry. The reality, according to the film, is that God owes neither prosperity to Arthur nor theological certainty to Larry. Others have compared A Serious Man to Job, and I wouldn’t deny the commonalities between the two. Like A Serious Man, Job is mainly about accepting the mystery of God’s purposes and humbly receiving everything that goes one’s way. But Job is not the end of the biblical parallels and references implicit in the film. In the long-anticipated march towards the ancient rabbi Marshak, the camera at one time focuses on a painting of the Akedah, i.e. Abraham’s attempted sacrifice of Isaac in accordance with the Lord’s commandment. Yet another example of God nearly subjecting a follower to extraordinary pain and loss for reasons not immediately known to him, this image can hardly be an incidental detail. Larry also evokes King David in 2nd Samuel when he climbs up on his own roof, catches sight of his beautiful neighbor sunbathing, and proceeds to seduce her in the absence of his wife’s affections. This thread’s relationship to the broader thematic fabric of A Serious Man is less obvious, though the Bathsheba story from David’s reign does caution us against holding discontentment towards the gifts the Lord bestows on us. For Arthur, that discontentment stems from his inescapable poverty, for Judith it stems from her marriage, and for Larry, of course, it stems from having to live with his own ignorance. 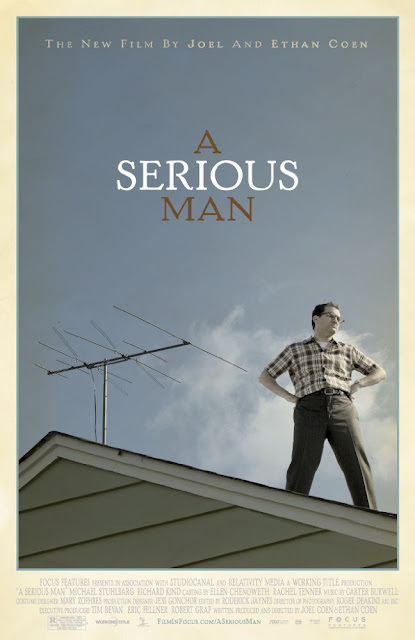 The storytelling structure of A Serious Man itself plays into the film’s concern with God’s unseen, unknowable plans. The script frequently meanders into subplots and tangents that appear superfluous until passing dialogue later fills in their meaning. The critical letters sent to Larry’s tenure committee remain a mystery up until the bar mitzvah scene, when Judith remorsefully lets slip that Sy Ableman had been writing to them. This turns out to be a narrative moot point, as Larry is granted tenure anyway, indicating that Hashem turns even the most malign and jealous motives to His own good plan. When Larry’s son finally fakes his way into the presence of the revered Rabbi Marshak, he is high on marijuana and the elder does nothing but babble song lyrics, but the boy’s misdeeds in getting to that point nonetheless enable him to recover his radio and the money he owes the bully Fagle, possibly leading to reconciliation between the two. On a presumably grimmer note, Larry’s X-ray examination at the beginning feels wholly disconnected from the rest of the plot until the ominous phone call he receives in the movie’s final moments. Whether this is building on the rambling story narrated by Rabbi Nachtner is open to speculation, though I doubt the Coens, in such a tightly scripted movie, would have interspersed that scene for purely comedic value. Isn’t it plausible that Larry also has the will of God (“Helping others… couldn’t hurt.”) engraved inside him, literally and metaphorically, without his knowledge, as did the goy in the rabbi’s far-fetched, incoherent parable? It’s certainly no coincidence that he notices both the call and the storm precisely after he determines to pass the student who bribed him earlier. If I have any quibble with the movie, it’s that the ending, either by purpose or by accident, dispels so much of the mystery the Coens have woven around Hashem and how he works. By so suggestively linking Larry’s fraud with the onset of the tornado, the concluding frames make God’s plan out to be fairly predictable and retributive and well within our human comprehension. As a whole, though, I found A Serious Man a deeply thoughtful, debatable and darkly comic take on our innermost longing (and inability) to understand the ways of God.